A statistic : It is estimated that an erupting basalt lava flow with a volume of 2000 km3 would release approximately 7 billion tonnes of carbon (or 26 billion tonnes of CO2). This is about the same as the amount currently released by burning of fossil fuels - each year. There is a strong correlation between continental flood basalts and mass extinctions (Courtillot, 1994). The three largest known mass extinctions coincide with the three largest Phanerozoic flood basalt provinces (P-Tr - Siberian Traps; Tr-J - CAMP; K-T - Deccan), within error of the sampling and dating methods. Furthermore, there are strong correlations between flood basalts and other indicators of system stress. For example, the Karoo-Ferrar Province correlates with a major oceanic anoxic event 189 m.y. ago, and part of the North Atlantic Igneous Province coincides with the Late Palaeocene Thermal Maximum, 55 m.y. ago. Despite searches, no comparable correlation exists between meteorite or cometary impacts and mass extinctions. These 'matches' are too fortuitous to be pure chance (White and Saunders, 2005), but an understanding of the actual causal link between a flood basalt event and a mass extinction is elusive. It is also worth mentioning that some flood basalts (e.g. the Parana) do not match with any indicators of serious system stress, and some small mass extinctions do not appear to correspond with any flood basalts. This may be because it is unlikely that there is one single cause for all mass extinctions. Figure Caption: Extinction rate versus time (continuous line, blue field) (multiple-interval marine genera, modified from Sepkoski, 1996) compared with eruption ages of continental flood basalts (red columns). 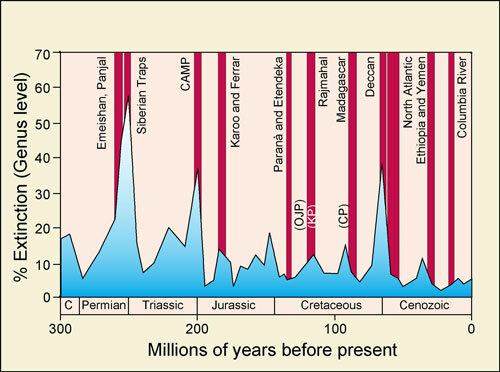 Three of the largest mass extinctions, the Permo-triassic, Triassic-Jurassic and the Cretaceous-Tertiary, correspond with the eruptions of the Siberian Traps, the Central Atlantic Magmatic Province, and the Deccan Traps, respectively. Three oceanic plateaus, the Caribbean (CP) Kerguelen (KP), and Ontong Java (OJP) are included. Modified after White and Saunders (2005). A possible scenario is that a single flood basalt eruptive event - more than 1000 cubic km - would erupt a very large mass of sulfur dioxide gas and aerosol, some of which would enter the lower stratosphere. This would reduce the amount of light reaching the Earth's surface (e.g., Thordarson and Self, 1996; Self et al., 2006). As a result, not only is the lower atmosphere cooled, but also photosynthesis could be reduced or even stopped if light transmission is sufficently impaired. A volcanic winter may ensue, lasting for the duration of the eruption (decades?) (Rampino et al., 1988). Perversely, perhaps, the indicators are that warming, rather than cooling, occurred during the P-Tr mass extinction event. This suggests accumulation of greenhouse gases in the atmosphere. Carbon dioxide is a possible candidate. The flux rate from a single flow is relatively small, but over millenia substantial amounts of CO2 will accumulate in the atmosphere-ocean system, due to the long averagelifetime of CO2molecules in this system. However, if photosynthetic systems were reduced by the preceding volcanic winter, the drawdown capacity of the marine and terrestrial systems may not have been adequate to prevent a gradual accumulation of carbon dioxide in the atmosphere. Eventually, the cold/dark - warm/light cycles may have triggered the release of methane hydrates stored in permafrost or in the seabed, resulting in catastrophic release of methane and carbon dioxide, and a runaway greenhouse may have ensued. It is fair to state, however, that we are far from a complete understanding of the details of this process.